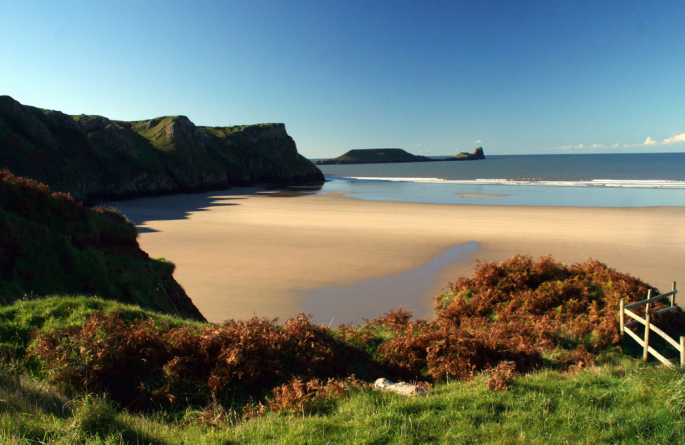 From stunning Rhossili Bay on the famous Gower Peninsula to Oxwich Bay with its beautiful castle, Swansea is home to some of the best beaches in Wales. So, whether you’re looking for a relaxing winter stroll along the sands or to grab your bucket and spade to build a sand castle with the kids, we couldn’t think of a better place to spend your time. Swansea is Wales’ second biggest city, a close second to its easterly neighbour the capital – Cardiff. And like its big brother, Swansea is a city on the sea. In fact, the gold sand and pebbles are just a five minute walk from our modern hotel. Rhossili Bay is arguably Swansea’s, and maybe even South Wales’, most well-known beach – and it’s easy to see why with this dramatically beautiful 3m of sandy coastline. This picturesque beach can be found in the most westerly bay on the Gower Peninsula, where it is prone to Atlantic swells popular among surfers of all abilities. To the west you’ll find the long, serpent-like outcrop that is Worm’s Head and to the east Burry Holms, both of which can be explored at low tide, along with the many ship wrecks that can be discovered among the sands. Rhossili Bay has been voted best beach in the UK multiple times (June 2010 and February 2013), as well as the third best in Europe, so we think you should pay this beach a visit for yourself to see what all the fuss is about. 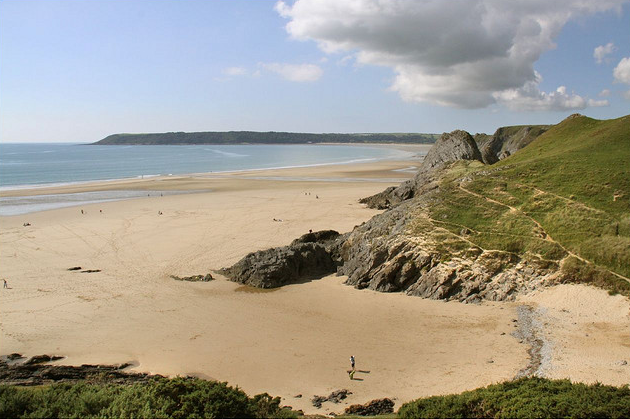 With a large sand beach that’s wheelchair accessible, allows dogs, located on a public transport route and has a carpark just 100m away, Oxwich Bay is a beautiful beach that is a convenient choice for all. 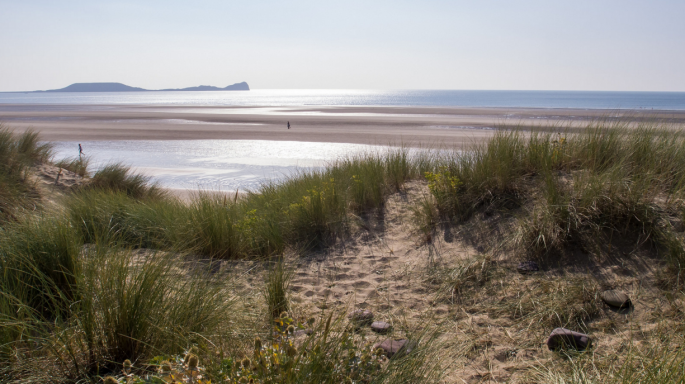 And with sand dunes, salt marshes and woodland, there is plenty to see and do, so you’ll never get bored here in the South Gower. Have a swim or give watersports a go, then take a leisurely walk along the cliff to take in the breathtaking views out over the South Wales coastline. If you like history, there’s also a wonderful castle nearby. Gorgeously wild, Three Cliffs Bay is one of Wales’ most photographed beaches thanks to its vast expanse of golden sand, three limestone cliffs, and magical castle ruins sat above its clifftops. The only downside is there’s no swimming allowed here. Take a hop, skip and a jump across the stepping stones and throw down a blanket to enjoy a picnic in ideal surroundings. 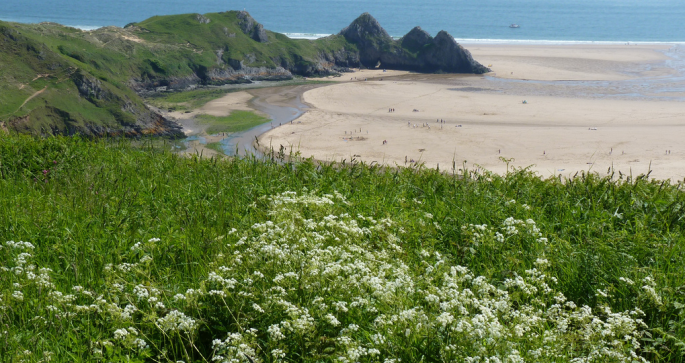 Gallop along with a pony ride down the shore as waves crash in or get harnessed up to join the many, experienced rock climbers who call Three Cliffs Bay their second home. This beach may have a steep descent from the nearest carpark, but, trust us, you won’t be disappointed with your visit. 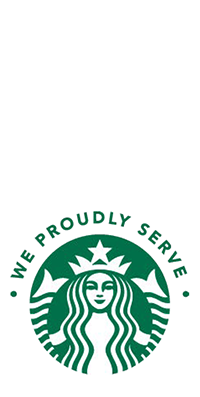 For more inspiration of things to do in Swansea please take a look at our blog or tweet us @TheDragonHotel. To check room availability at The Dragon Hotel, search your chosen dates here.